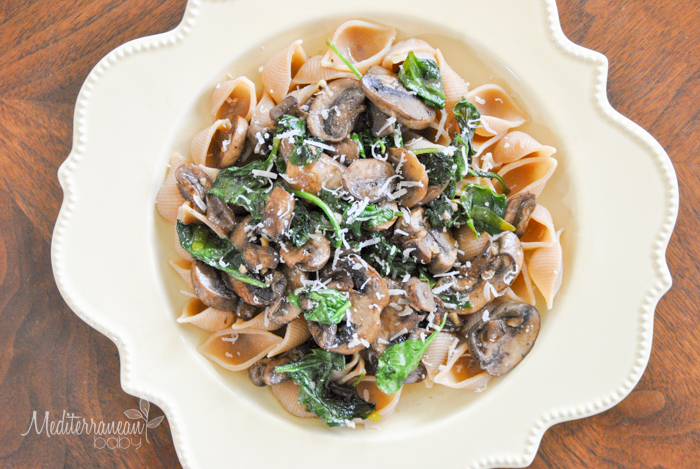 Let’s keep up our healthy, filling, body fueling recipes with this Spinach and Mushroom Power Pasta. Trust me, it is delicious! I have never been one to enjoy whole wheat pasta and usually turn my nose up at the idea, but when it comes to losing weight and avoiding hunger, my pallate has changed its mind! In fact, I’m actually enjoying it. DeLallo’s makes a great whote wheat pasta if you can find it. Bring a small pot of water to a boil, add pasta, and cook until al dente. Drain and set aside. In a large skillet, heat olive oil and chopped garlic until fragrant. Add mushrooms and a bit more olive oil if the pan seems dry. Continue to saute until you reach desired doneness. Add vermouth to the pan and allow to reduce by half. Add spinach to the sauce and a pinch of salt and pepper. Toss pasta in the pan with the sauce to evenly coat. Plate and top with a sprinkling of cheese. This looks so delicious! Whole wheat pasta has definitely been an acquired taste for me, but one worth acquiring!